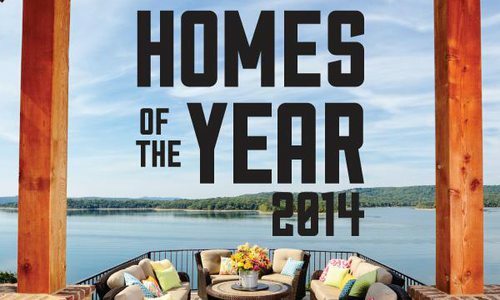 Our team asked southwest Missouri builders to nominate their best work from the past 365 days. Residential builders wow us with their innovative minds, and this season proves no different. Each year we choose a different group of experts to judge the entries, and this year we turned to the Northwest Arkansas Home Builders Association. A panel of judges examined each nomination to narrow down the contestants based on the interior and exterior and how the client’s goals were met. 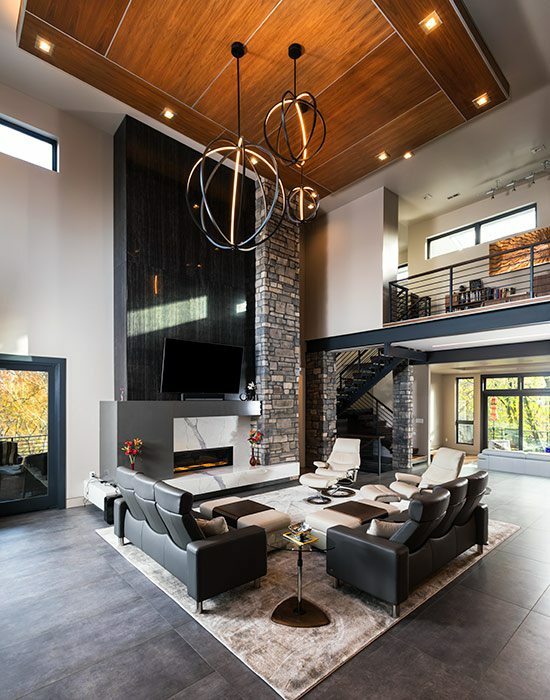 Once the results were in, we picked apart each project, investigating exactly how a work of art can double as a home, and found out what you need to know before starting your own custom-home project. 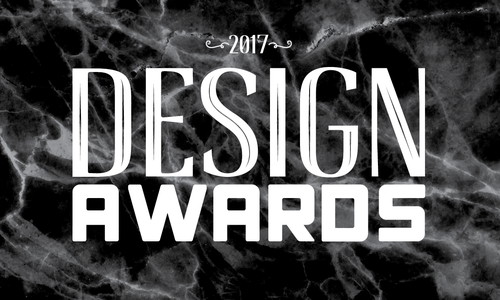 Take a look at the winning homes and let your ideas run wild. Winning Builders: Brett & Skyler Godfrey, Built by Brett Inc. Modeling their home after a luxurious hotel, these southwest Missouri homeowners, along with Bella Homes, traveled as far as Las Vegas to find the perfect inspiration for this staycation mansion. What if instead of leaving your home to go on vacation, you brought the vacation home to you? 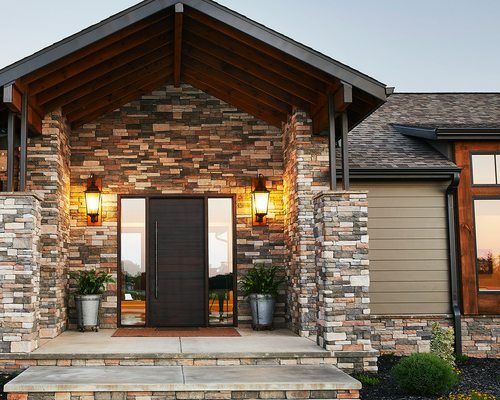 A set of southwest Missouri homeowners wanted their next home to model high-end hotel luxury and enlisted the help of Justin Skiles, owner of Bella Homes, for his expertise. For the next three years, the team researched how to produce a comfortable modern home equipped with glamorous luxuries. 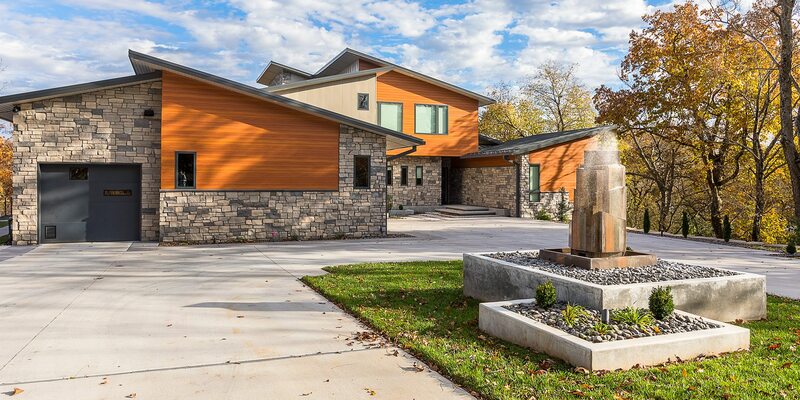 “We did take a trip to Las Vegas to the International Builders’ Show to start to lay out details and look at designs and products just to try to give it a better building process once we got started,” Skiles says. The inside of the home is just as splendid as the outside, with the help of Andrea Deckard, owner of A. Deckard Interiors LLC. 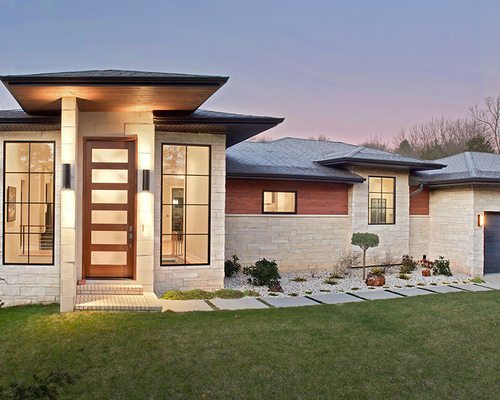 Natural wood accents, exposed metal and white stone accents are repeated throughout the home. “I do quite a bit of work on hotel projects, so the idea that this home would be modeled after a luxury hotel struck a note with me,” Deckard says. The result is something only found in faraway lands. Of course, there are the necessary components to suit the active couple’s lifestyle too, such as the indoor training pool, a gourmet chef’s kitchen and a large indoor gym. Because why not, right? The focus of the living room was to echo a high-end hotel lobby. The floor plan is incredibly open, so much so that most of the house can be seen, including a sunken formal living room, kitchen, stairs and part of the second floor. The fireplace emphasizes the room’s height and is meant to be a conversation piece. 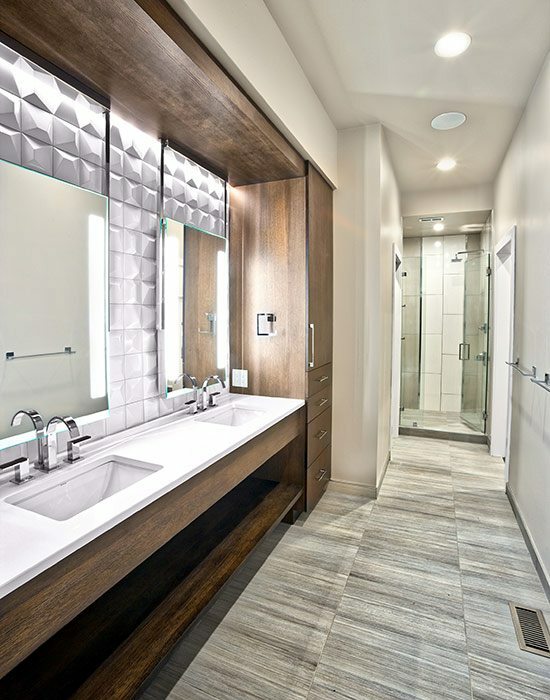 A combination of white quartz countertops, walnut wood and Italian porcelain floors creates a feeling of elegance for the couple’s master bathroom. Located just off the master bedroom, the room fulfills the homeowners’ desire to carry out a feeling of glamour. 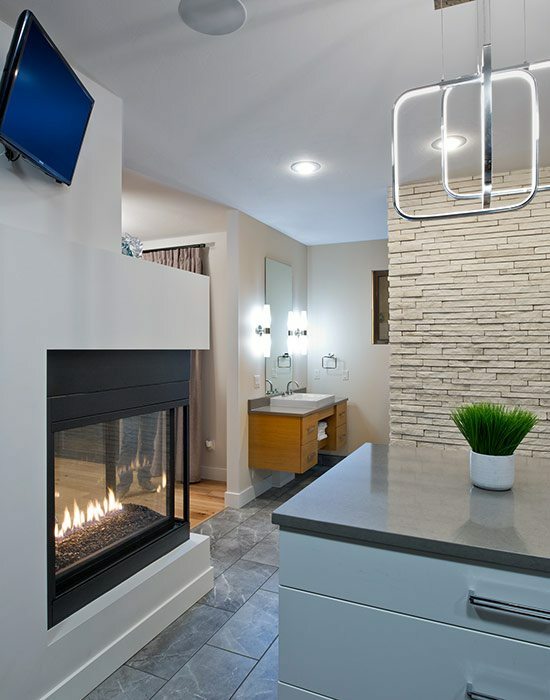 They decided to add a wow factor with ceramic pillow-top backsplash behind the freestanding mirrors. 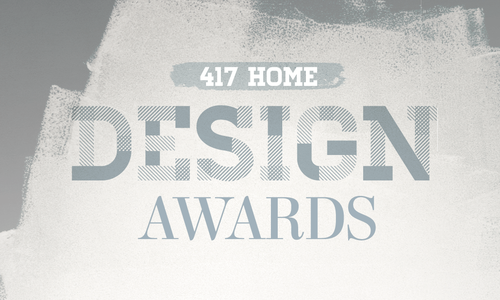 417 Home: What should people be careful of when planning a modern home? Justin Skiles: The house has always been intended to be very clean and modern without becoming sterile. Sometimes we get into modern projects and the environment starts to become cold and that was one thing we were trying to avoid. 417: How did you bring the outside in? J.S. : We did that by accomplishing things with the stone on the house and bringing the stone inside. [We were] just trying to get that warm tone along with our modern designs. 417: How did the location of this house draw out construction? J.S. : On one side of the property, it’s actually about a 75-foot drop, and there was no way to access the south side of the home. It was a very narrow driveway going in, so bringing in equipment and machinery was very time-consuming. 417: The couple is very active. How did you combine their needs with the seclusion of the property? J.S. : When we did the pool, it’s indoor, but we wanted to bring the outside in. If you’ve ever been to a high-end hotel, the exercise room looks into the pool, and the pool looks out onto the patio, and that’s one of the feels that we did. Photo by Starboard & PortLeading up to planning and building their dream home, the owners spent a lot of their time on their land, hosting bonfires and mowing to get a feel for the area. 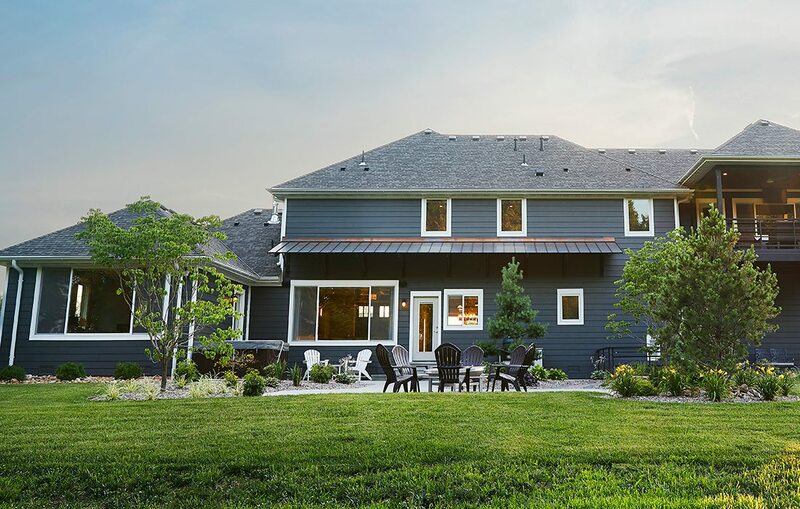 The couple didn’t want a large two-story home that would disrupt the scenic views, so Rhoads Construction & Design kept the frame of the house low to the ground and implemented bump-out details to break up the exterior. Rhoads Construction & Design was able to pivot quickly as they went from planning a couple’s barn to creating a contemporary ranch. The project started out as a barn for entertaining—perfect for a weekend escape. The homeowners wanted to build a retreat on their 15 acres of land, but after realizing how much potential the plot possessed, they scrapped their weekend hideaway and started crafting a long-term countryside escape. The property itself is picturesque—a wide, custom-made door faces the north overlooking a cattle pasture and silo. To the south, the back patio looks out over a low valley. The couple’s love for their little slice of Rogersville is what drove the project. Owner of Rhoads Construction & Design Adrian Rhoads says every single placement was deliberate. 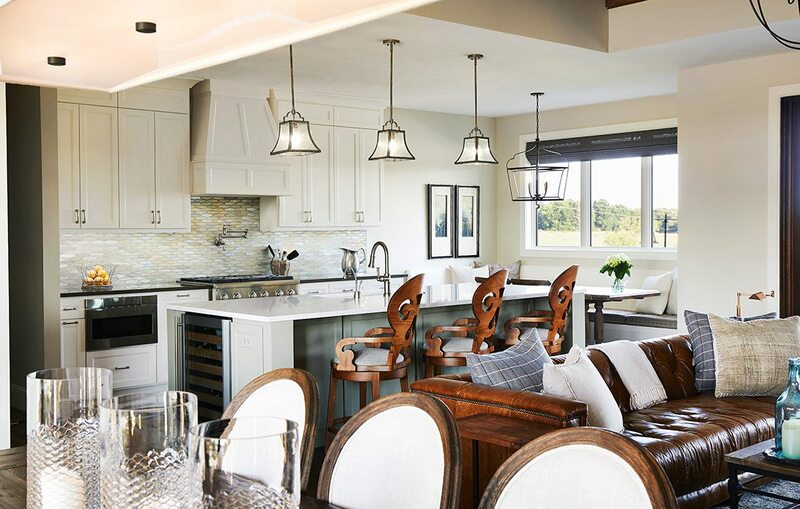 Combining the land’s beauty with the couple’s style, Rhoads Construction & Design placed pine floors throughout the house, bringing the rooms together. 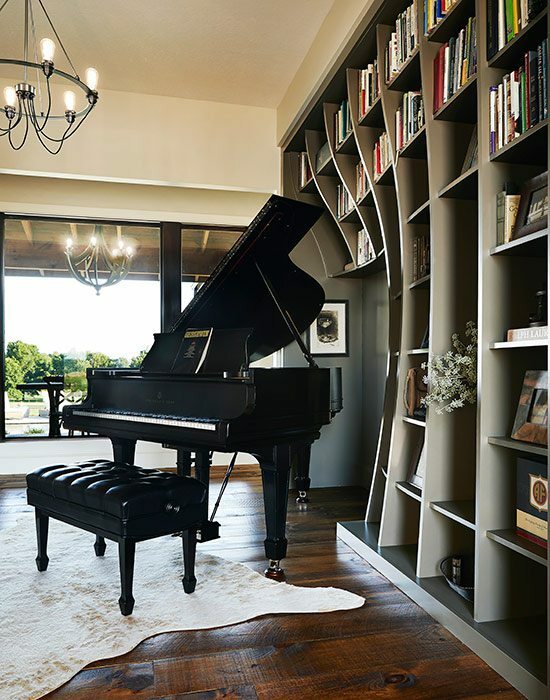 Achieving the couple’s originality was a little more difficult than capturing scenic views—the couple wanted a wall-length bookshelf in their music room and the feature took plenty of detailed drawings before building could begin. The result of careful planning on both ends is breathtaking. Photo by Starboard & PortThe homeowners didn’t want their home to close off or isolate other areas. Instead, they wanted the house to feel fluid and functional, so they placed plenty of seating around the kitchen and leading into the living room. Off to the side is a breakfast nook, and a sink sits in an island overlooking the central spot of the home. The bathroom and closet were just as important to the homeowners as their master suite itself. 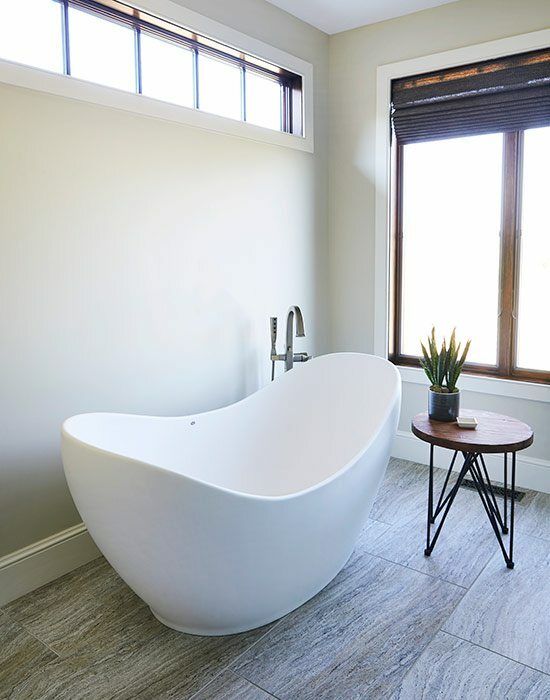 A white standalone tub with a unique shape was chosen to sit across from a large shower with a frameless door. The floors are heated tile both inside and outside the shower. Ample counter space allows for his and hers spaces, along with a small area in the middle for a makeup station. Photo by Starboard & PortThe contemporary ranch style is emphasized in small details throughout the house through metal lighting fixtures and elegant wood chairs and coffee tables. Details like these tie in with more pronounced features of the house, like the floor’s rougher finished look, marked with knots and small imperfections. Stone used on the exterior of the house guided the interior choices. 417 Home: What was challenging about planning a completely new structure? 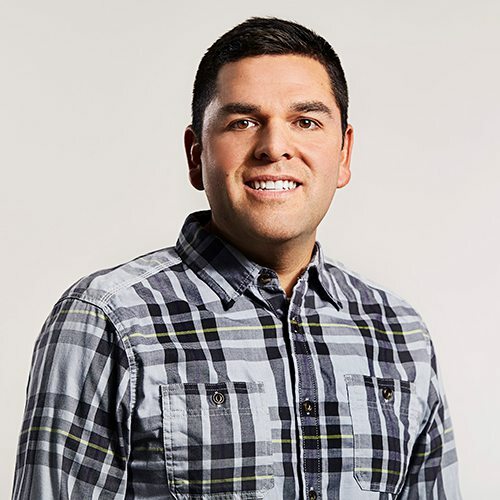 Adrian Rhoads: That was the first time we moved into a completely different direction, and I think what was interesting was how seamless the transition was. There wasn’t some specific event that we had to have this completed by. Because they didn’t put that type of deadline in place, it allowed them to process what their long-term goals were. 417: How could the process have gone differently? A.R. : I think had they forced the issue on the front end, they probably would have a barn and may not have a house. I’m not saying they wouldn’t have been happy with that decision, but they are very content with the decision they made now. 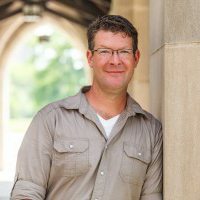 417: How can planning save time and resources? A.R. : On the front end, you can make lots of changes and adjustments and it doesn’t cost you anything except the time of the design company. Once you get into construction, those changes can become very costly and time prohibitive. 417: What made the process so smooth? A.R. : We had a very open dialogue. Construction is a large investment, and you [must] have a comfort level with the team you go with. 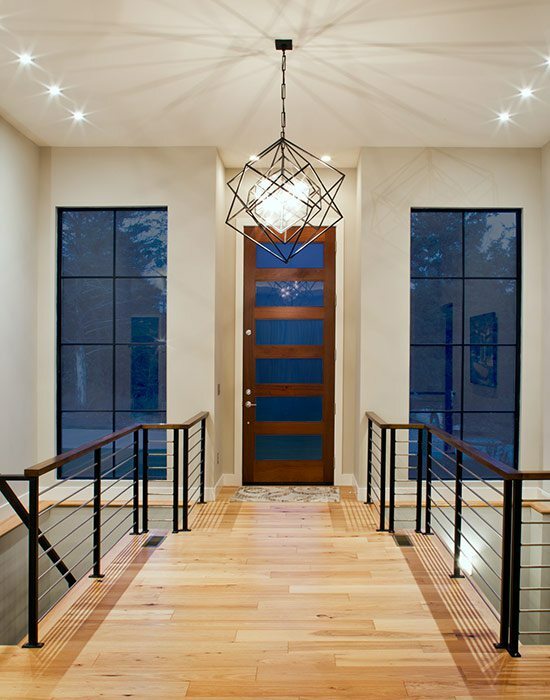 Photo by Starboard & PortWhen designing the exterior of this home, Rhoads went for an updated twist on traditional. 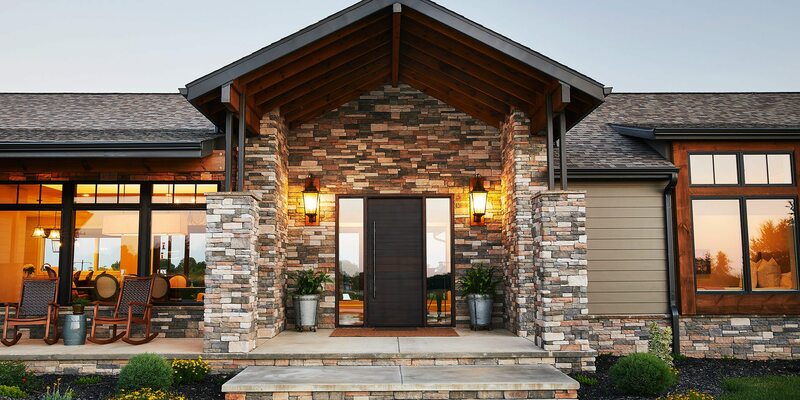 The dark gray siding contrasts against the stonework, and wraps all the way around to the back of the home. 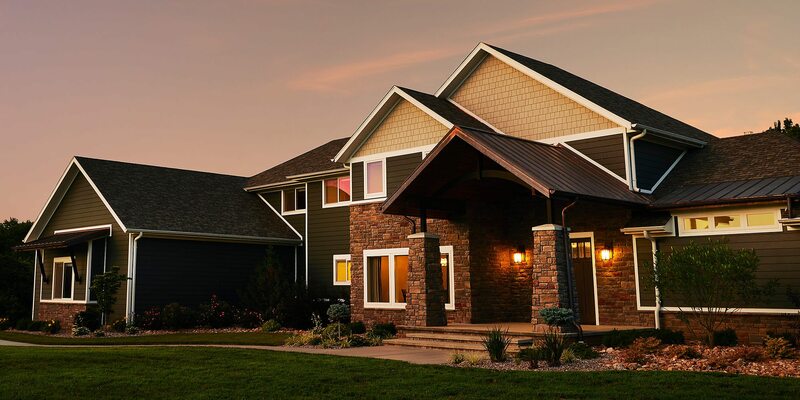 Using painted steel throughout the home and topping it off with a copper accent roof, Rhoads Construction & Design pulls off a twist with an open floor plan. The deep blue coating the outside of the home does not foretell the inside’s bright and open floorplan. 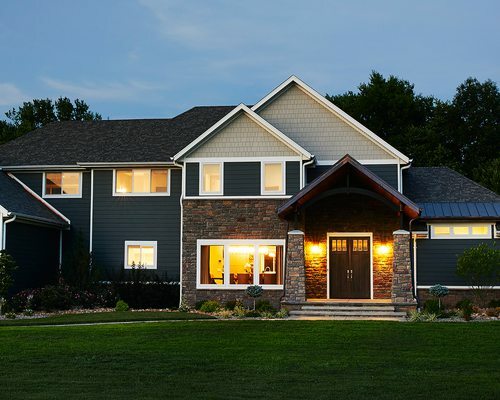 Needing to house a family of seven, the homeowners came to Adrian Rhoads, owner of Rhoads Construction & Design, for a custom-made home large enough to welcome back their young-adult children and future guests. Wide, open space would give them the best of both worlds, so Rhoads used large steel beams to make the home structurally sound, dressing the house in a dark exterior color scheme and pushing for brightly lit rooms from within. Efficiency was a forefront goal. The upstairs and main living area run on two different heating and cooling units so the homeowners save on utilities while their kids are at school. The main floor houses the master suite, along with other essential rooms to make daily life possible. 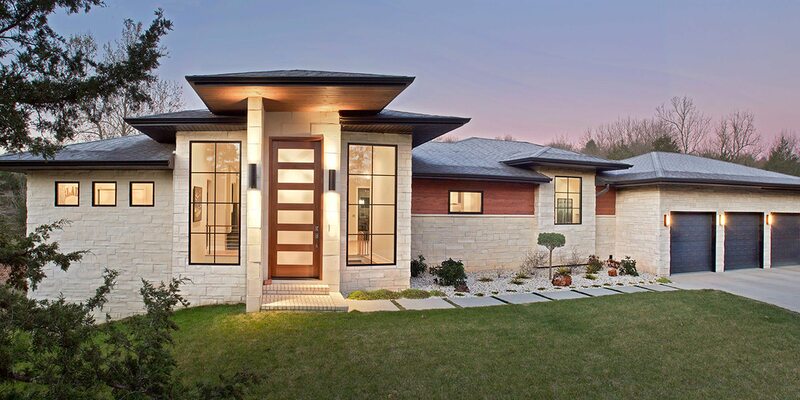 Considering the family’s needs and desires, Rhoads and his company built a thoughtful, functioning base that combines need with beautifully crafted structural elements. Photo by Starboard & PortRhoads Construction & Design placed traditional elements throughout the home, but to accent them, they added touches of metallics here and there. This is evident in the kitchen, especially in the backsplash that mimics brick but is actually made of oversized subway tile. The custom-made exhaust over the range is also metal. Located in the mancave, the windows to the wet bar can open, letting it act as a serving area to the backyard patio during warmer months. 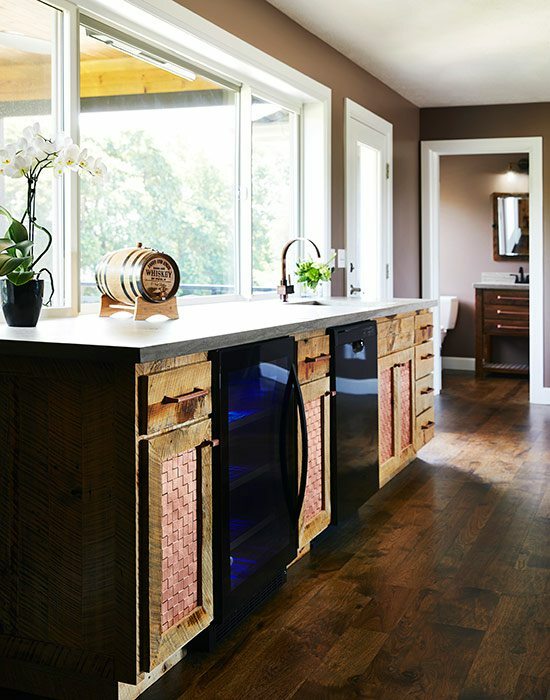 The feeling of the bar is rustic, with small metal panels mounted into the wood cabinets. The same countertops used in the second-floor Jack and Jill bathroom top off the piece. The only explicit wish of the homeowners was to create a Scooby-Doo room. 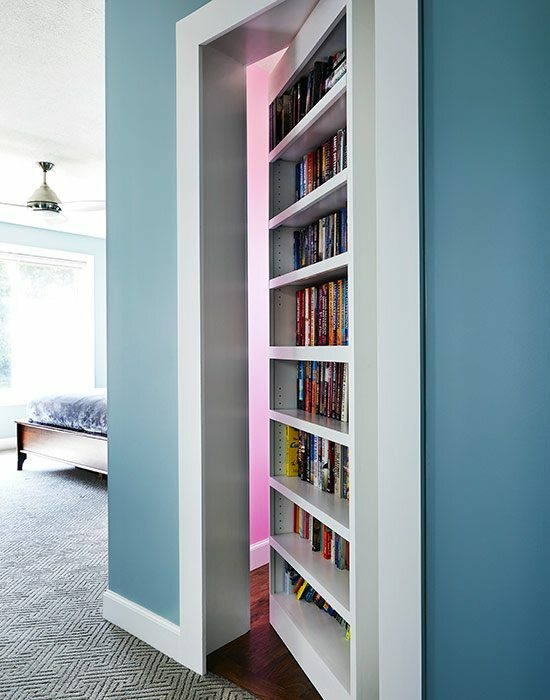 Obscured by a tall bookshelf, the hidden door swings open to a private cranny stocked with books and a comfortable chair, creating a retreat for when life’s hustle and bustle becomes too much. 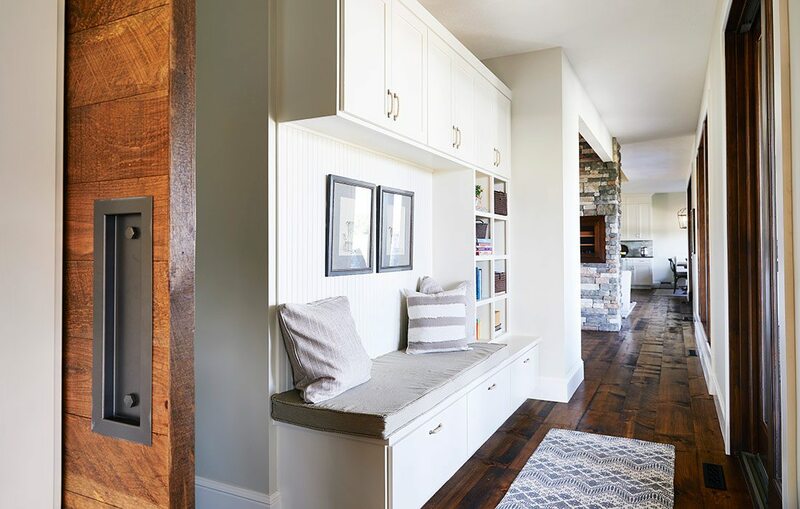 This was the first hidden room Rhoads Construction & Design created and designed, and its successful discreet nature is a testament to their thoughtful planning. Photo by Starboard & PortA steel canopy covers the door opening to the backyard entertaining space, again mimicking the main house with a copper accent roof. Off to the side is a small balcony leading to an entertaining area on the second floor and below that a small green space for the couple’s dog. Adding in more greenery around the walkways and sitting areas is the finishing touch. 417 Home: What features were important when building this family home? Adrian Rhoads: The only thing specific the family wanted was the Scooby-Doo room. There’s a reading nook hidden behind a bookshelf, and I think that was the one wish. 417: How did you combine the need for efficiency and the desire to have a space suitable for entertaining? A.R. : They’ve got kids, and that dictated how we built the house. They’ve got bedrooms upstairs with different heat and air systems for when they are not there. The main floor is really devoted to them. 417: How did you add details later as you built the house? A.R. : We did an outdoor fenced area that led to a dog-door, which goes into a mechanical room that acts as the dog room. We just happened to repurpose a room that already existed that we needed and incorporated the dog into it. 417: What is difficult about an open floorplan? A.R. : It creates some structural issues. An open floorplan doesn’t like columns and beams and supports. An open floorplan minimizes the use of walls and columns, so to do that, we have some very large steel beams that are hidden and [are] what’s holding the house up. Photo by Dan FrischDifferent textures were a must for wowing visitors, so owner of Built by Brett Inc. Brett Godfrey and the homeowners decided to use a mix of brick, stone and imported German spruce wood for the exterior. The color scheme paired well with the limestone and surrounding vegetation. 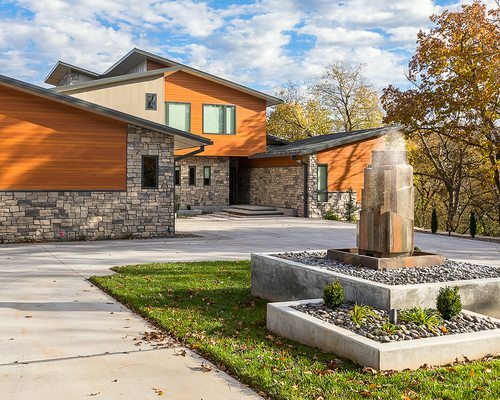 Winning Builder: Brett and Skyler Godfrey, Built by Brett Inc.
Hidden in the midst of the Ozarks’ natural flora, a Built by Brett Inc. custom home caters to the native landscape, adding plenty of personalized features to boot. Before they began planning the transitional home of their dreams, one Springfield couple chose a three-acre lot for its Ozark native foliage. They relied on Built By Brett’s own Brett Godfrey, who has over 100 custom homes under his belt, for his eye toward the unusual. The couple’s two biggest wishes were to highlight the plot they were building on and to create a home with as much open space as possible. Not wanting to disrupt the natural look of the property, Godfrey says the planning process took careful consideration including decisions regarding which trees to leave untouched. The inside of the home was meant to exhibit a modern look, but not necessarily sterile. “They were not wanting the old Springfield version of the French country style,” Godfrey says. “They were tired of that. They wanted something that was modern but not too modern, so heavy on the transitional is the style they were after.” Nine months later, the combination of traditional and contemporary styles was fine-tuned and completed, resulting in an open floor plan with crisp white lines and minimal touches. Throughout the home are floating and suspended features combining the couple’s wishes for form and functionality that make every guest stop and stare. 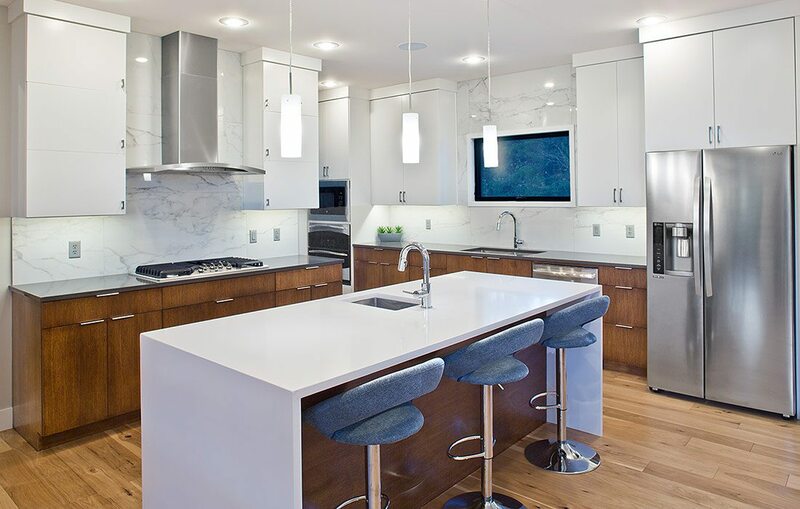 Photo by Dan FrischWhite, crisp lines were emphasized the most in the modern, sleek kitchen. 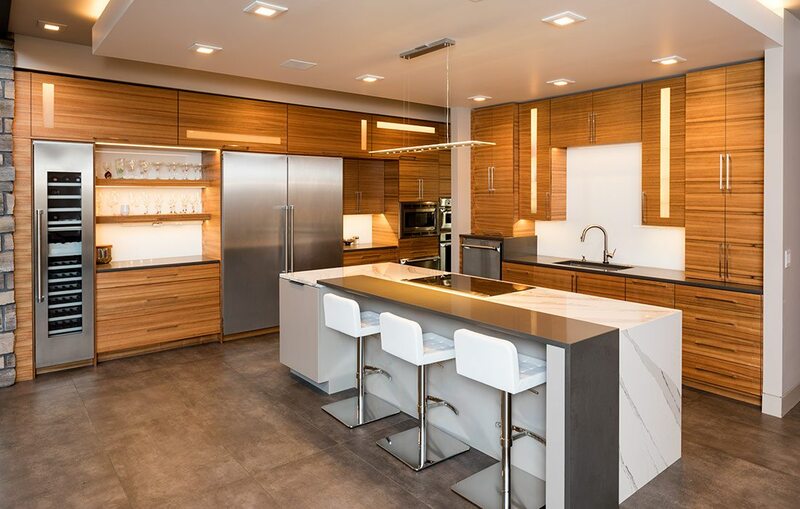 Simplistic, frameless-style cabinets and a big island with a waterfall top cater to the needs of a large family and helped keep a clean style. To minimize a busy look, white quartz countertops were installed instead of granite or marble. The front door is custom-made out of cypress, and as soon as guests cross the threshold, they are greeted by large windows looking out the back of the house. Within the first few feet of the entry, guests walk onto a bridge that connects to the kitchen and living room. On either side, guests can look down over the railing into the basement. Closet and master bathroom converge into one in this mega relaxation zone. A walkthrough shower separates two vanities, and a built-in chest of drawers separates bathroom from closet. The couple decided to splurge in this room, specifically the large shower, which has two sets of controls and showerheads. — Brett Godfrey, Built by Brett Inc.
Photo by Dan FrischThe master bedroom is a continuous room leading into the bathroom, a choice the homeowners made to keep the house as open as possible. A small balcony sits outside the couple’s glass double-doors, and a fireplace can be seen from three sides opposite the couple’s bed and helps divide the bedroom from the master bathroom and closet. 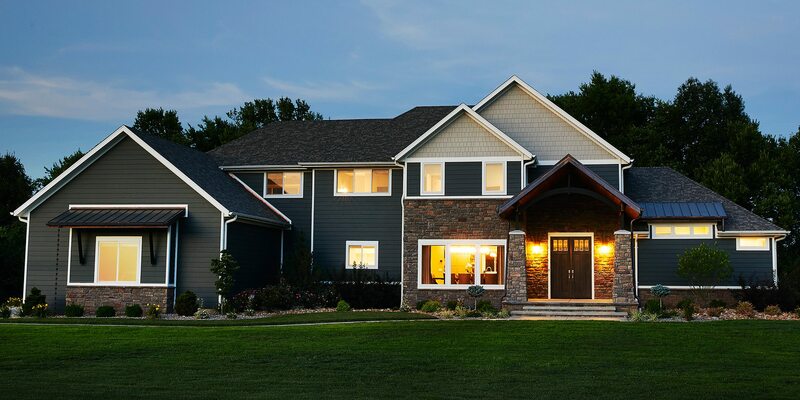 Builder Q&A: Brett Godfrey of Built by Brett Inc.
417 Home: When a homeowner wants to be thoughtful toward the plot of land they are building on, how do you cater to them? Brett Godfrey: You have to look way down the road and pick your trees you don’t want to disturb and keep in mind you have to have a place to put materials and driveways. 417: What about the home’s actual location considers the acreage? B.G. : It’s more immersed, so you really don’t see the house unless you’re looking for it. Three experts with the Northwest Arkansas Home Builders Association judged this year’s contestants. With 30 years of design and building experience, Janacek Remodeling is recognized for catering to residential remodeling and additions. 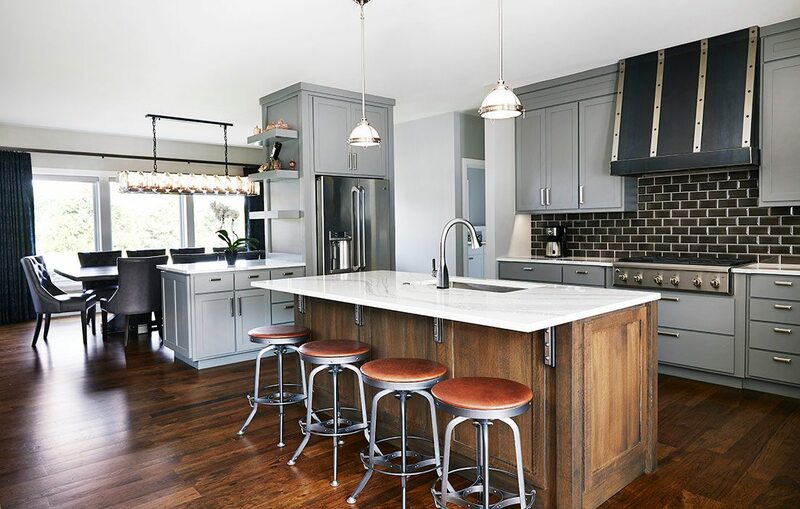 The company’s reputation is well-established in the area as Janacek himself was selected as a “Top 500 Remodeler in the Nation” by Qualified Remodeler Magazine and continues his education through earning certifications. 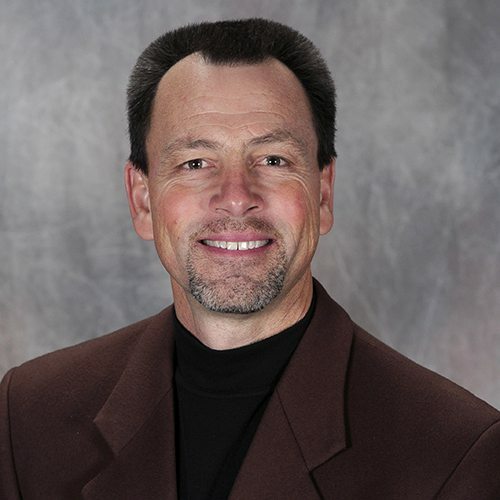 He has been active in the Northwest Arkansas Home Builders Association for more than 18 years, serving as president for two terms. As a supporter of local businesses for more than 20 years, Shana Kasparek brings expertise in event planning, networking and cultivating business relationships to her new role as executive officer at Northwest Arkansas Home Builders Association. After she moved to Fayetteville to earn her master’s degree from the University of Arkansas, Kasparek fell in love with the area and now aims to grow relationships that will help businesses and home building in Northwest Arkansas thrive. Since founding Celtic Construction Inc. in 1994, Lee Scarlett’s work has been featured in 14 state, national and international publications, including the Wall Street Journal. Scarlett’s company was one of 2017’s Top 50 Luxury Builders in the nation and No. 1 in Arkansas by Home Builder Digest. 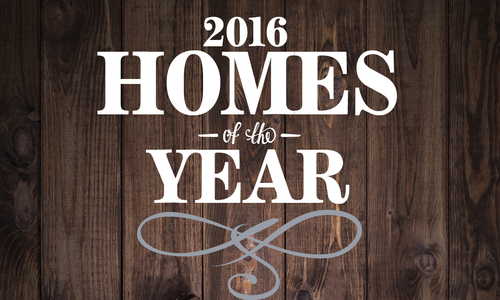 Scarlett himself has been voted 2010 through 2017 “Best Home Builder” in CitiScapes Magazine, proving eight years’ worth of recognition.